Bully’s Pub is an excellent choice if you’re looking to grab some great quality food, relax and watch your favourite sports team in the centre of Bangkok. The famous local bar first opened its doors in 2004, and has been delighting travellers ever since with its friendly and vibrant atmosphere. 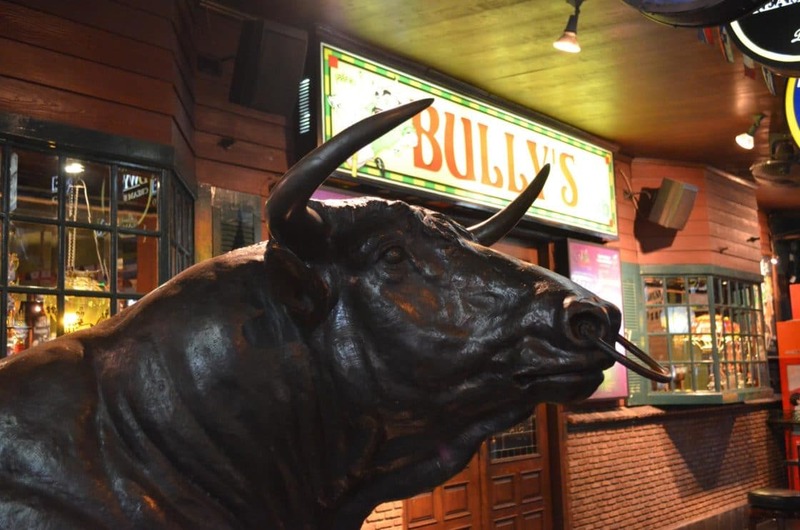 Located in one of the busiest areas of the city, you’ll find Bully’s Pub between Soi 2 and 4, on the bustling Sukhumvit Road. 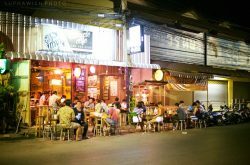 With its unique cultural identity, the longest road in Thailand boasts an eclectic mix of eating, shopping and nightlife. The area is surrounded with a variety of busy entertainment complexes, and the renowned Nana Entertainment Plaza is only a two minutes walk away. Open Monday through Sunday, from 11am to 1am, Bully’s Pub is your refuge from the wild and alluring Sukhumvit Road nightlife. The bar is a mix between your typical sports bar and somewhere you can relax and have a conversation. 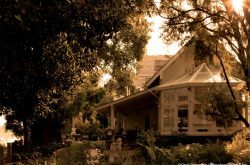 It has a lively and jovial ambience, which is ideally suited for weary travellers looking for somewhere to enjoy some down time. At Bully’s you’ll find bench seats, long tables, high stools and a large selection of western beers and ales. They have an extensive menu ranging from British and American favourites, to easy-eating comfort food and traditional Thai dishes. The menu is very reasonably priced, with great service and good quality food. A trip to Bully’s Pub wouldn’t be complete without trying their delicious BBQ ribs or extra hot Buffalo wings. The portion sizes are large, and the meat is so tender it drops from the bone. You’ll often see locals and expats alike washing these down with a well deserved cold beer. Some evenings you’ll find live bands playing in the busy pub. You can kill some time on the various pool tables and dart boards. There’s a large outdoor area with seating, and a cool air-conditioned inside space. Live sports is the main draw for Bully’s Pub, with HD TV screens showing a selection of sports daily. If you love football, you’ll find all the best matches from the English Premier League, Spanish La Liga and UEFA Champions League among others. Various other sports like Rugby League, Rugby Union, darts and golf are also shown, meaning you won’t miss any of your favourite sporting events. For someone who is an NFL fan, finding a live showing of Monday Night Football in Bangkok can be quite tricky. Bully’s Pub shows the games live and in the morning, so you’ll find many expats watching their team with a hot American breakfast and a freshly prepared Bloody Mary. With it’s central location, excellent food and wide selection of beers, Bully’s Pub is an ideal place for you to hang out after a long and hectic day spent exploring Bangkok. Bully’s is one of my favorite pubs in Bangkok, great food, good selection of beers and live sport. Bully’s is a favourite of mine, awesome for watching live sports, serve really good burgers and international beers.